For students who already know where they are headed, Wisconsin is the place to start. Combining a uniquely deep experience in a designated area of study with a strong foundation of business principles, Wisconsin MBA students graduate with a portfolio of skills, experience, and specialized knowledge that allows them to hit the ground running and immediately contribute to the success of their organizations. The University of Wisconsin—Madison seeks students from diverse personal, professional, and cultural backgrounds, who have demonstrated success in business and management. Last year's class had an average GMAT score of 666 and average work experience of 4 years. In addition to their academic and professional achievements, Wisconsin looks for studen...The University of Wisconsin—Madison seeks students from diverse personal, professional, and cultural backgrounds, who have demonstrated success in business and management. Last year's class had an average GMAT score of 666 and average work experience of 4 years. In addition to their academic and professional achievements, Wisconsin looks for students who demonstrate intellectual curiosity, motivation, leadership, communication skills, and analytical ability. An applicant's fit with their chosen career specialization, academic record, standardized test scores, and work experience are among the most important factors in an admissions decision. Starting at Orientation and through the first months of their MBA, students receive plenty of help to initiate their internship search, including instruction on resume writing, inter­viewing, researching companies and more. After that, students have access to the Career Center’s Internet database as well as one-on-one career advising with professional coun­selors. However, the program’s unique in-depth focus is what really makes the difference in career placement. A current student explains, “Access to corporate recruiters is unprece­dented since we have a program which consists of specializations, rather than a generic MBA. You get put on a niche career track right away, so recruiters know exactly what they’re getting during interviews.” With strong ties in the region, 60 percent of students take jobs in the Midwest. However, for those looking to expand their horizons, students reassure us that “last year and the cur­rent year, we have been utilizing our alumni and board member connections to send a sig­nificant number of finance students out to New York for positions with bulge bracket firms.” Currently, the top 5 recruiters at UW are: Johnson & Johnson, Procter & Gamble, General Mills, State of Wisconsin Investment Board, Cisco Systems, Inc. 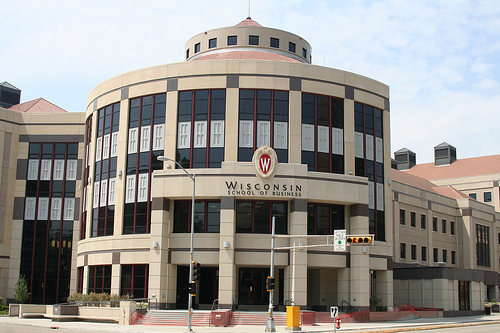 The Wisconsin MBA offers 10 career specializations, 8 of which are endowed centers of expertise. They include: Stephen L. Hawk Center for Applied Security Analysis, Bolz Center for Arts Administration, The Center for Brand and Product Management, Nicholas Center for Corporate Finance and Investment Banking, A.C. Nielsen Center for Marketing Research, The Erdman Center for Operations and Technology Management, The James A. Graaskamp Center for Real Estate, The Grainger Center for Supply Chain Management. Graduate International Business Association The principal purpose of the association shall be to encourage and promote involvement in international business education and practice, as well as international understanding, cooperation and goodwill, among students in the Graduate School of Business of the University of Wisconsin-Madison, its graduates and the communities they serve. Activities: International Case Competition, International Potluck, Sessions on Global Business Issues, Career Information Sessions, Business and Social Networking. Out for Business is a social, educational, and career development resource for Wisconsin MBA LGBT business students, alumni, faculty and administrators, and the greater business community. The group aims to create an inclusive and diverse atmosphere at the University of Wisconsin-Madison Wisconsin School of Business, promote positive visibility on the UW campus for LGBT business students, act as career resource for current business students through networking and mentorship, address diversity issues specific to LGBT business students, and provide a contact point for gay-friendly firms. The purpose of Diversity in Business is to expose professional graduate business students to a broad array of cultural experiences and backgrounds. Working together in a culturally enriched environment with the common goals of academic and future career successes across disciplines will enhance members' abilities to perform in the global environment. Business Learning Center http://www.bus.wisc.edu/blc/ Our primary mission is to help students excel by providing ancillary academic support in quantitatively based business-related courses. For full-time MBAs: 10 days in January in Great Britain, Spain, United Arab Emeriates, Qatar, Saudi Arabia. 5 days in March in Denmark and France. 14 days in May in Brazil, India, China. Through the Global Real Estate Master(GREM) - HEC Paris, France; HKUST Business School, Hong Kong; and INCAE Business School. Want more info about University of Wisconsin, Madison, School of Business Full Time MBA? Get free advice from education experts and Noodle community members.